Butter up to your loved ones (and your steak!) this week with these compound butters that amplify any part of your meal. 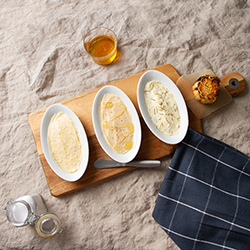 Take your pick from Garlic and Rosemary, Honey and Cinnamon, or a classic coarse Sea Salt. Melt one stick of butter until just softened. Mince garlic, chop herbs, and mix all ingredients into one bowl. Refrigerate until served. To save for later, place butter onto plastic wrap and roll it into a log. Twist off both ends and refrigerate. Cut slices off log for easy and clean future use. Add desired amount of sea salt to butter, and mix together. Set butter out until softened. Add in honey and cinnamon and beat together until a creamy consistency.